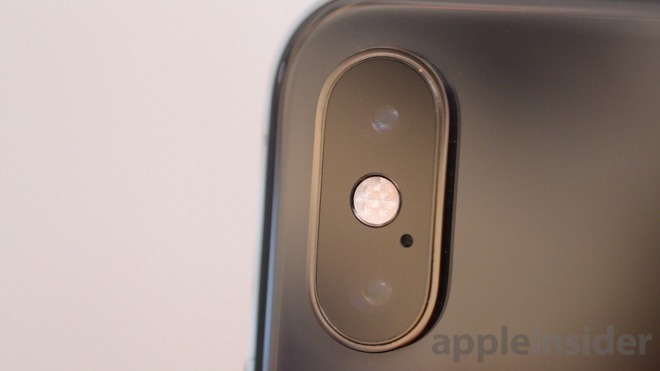 The camera bump has received criticism in the past for being one of the disappointing elements of the iPhone design, sticking out of the back of the device and making it impossible for the iPhone to lie flat on a surface. Depending on the model, this can increase the overall thickness of the iPhone by a few millimeters, spoiling the sleek physical appearance for some owners. Apple does have a number of issues it has to face when squeezing the camera assembly into the svelte iPhone frame, but one challenge that many won't have thought about is the possibility of interference. As the electrical communications paths between components have to be spaced apart from each other to avoid crosstalk, the sheer density of components in a small form factor device makes this difficult to achieve. The number of electrical signals also poses an issue for cameras with Hall Effect sensors, which are used to determine the position of internal components, such as the lens relative to the image sensor in an Optical Image Stabilization system. Since these require a moving magnetic field to function, they could be placed near to a magnet attached to an actuator, a component that further limits the placement of the Hall Effect sensors. 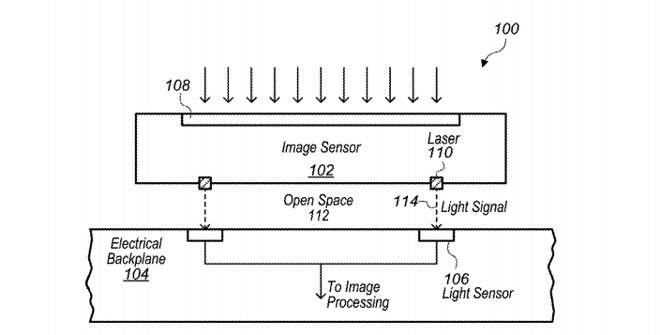 In a patent application published by the U.S. Patent and Trademark Office on Thursday, the filing for an "Image sensor with optical communication capabilities" suggests the use of multiple light modules to allow an imaging sensor to transmit data to an electrical backplane that connects to the rest of the device's hardware. The hardware can contain one or more light source modules embedded in the image sensor closest to the backplane, which in turn has light sensors. To allow for higher data transfer rates, as required for high-definition video, multiple source and sensor pairs can work in parallel. 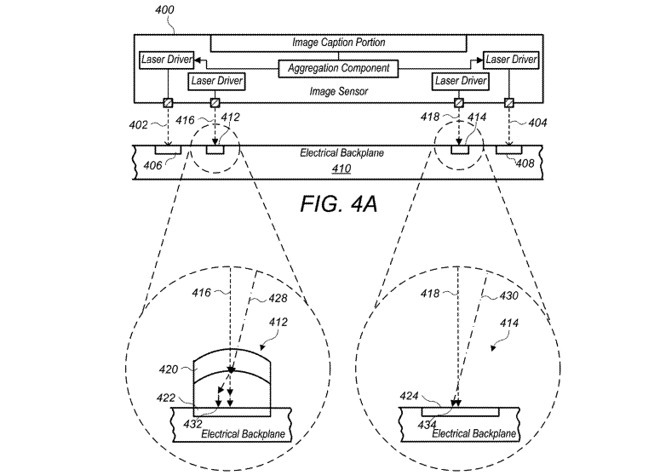 To accomplish this, the system could use vertical-cavity surface emitting lasers (VCSEL), the same technology used to drive the TrueDepth camera's facial depth mapping function seen in iPhones since the iPhone X. The VCSELs can be embedded in a silicon substrate, exposing an area less than 100 microns in height above the surface for transmission to sensors. While mainly used for communication, the same system could also be used to determine any changes in the imaging sensor's position. A shift for the imaging sensor relative to the backplane can be measured using the light-based data transfers, by monitoring changes in the amount of light received by the light sensors on the backplane. This data could be used to drive actuators connected to the image sensor, putting it back into its original position relative to the backplane. 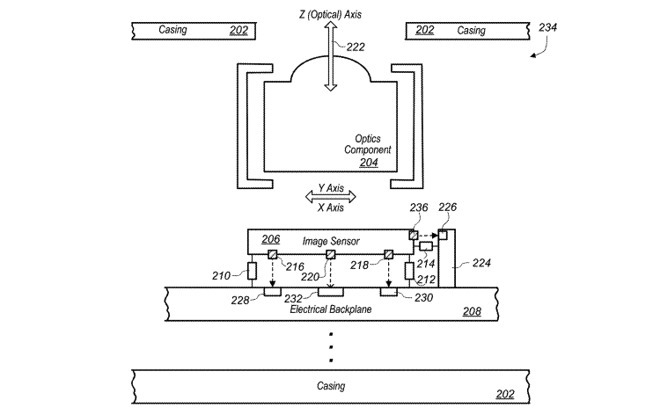 In effect, this can replace some of the functionality produced by the Hall Effect sensors, and in turn could allow the camera assembly to be closer to the rest of a smartphone's circuitry, potentially reducing the bump. Apple does produce numerous patent applications on a weekly basis, but the existence of a patent or application cannot be used as confirmation of what Apple will bring to market, more ideas it believes are improvements in fields of interest. In short, it is possible that Apple could use the technology to reduce the camera bump, but it remains to be seen if it will actually be employed in a future consumer product. The filing suggests an alternative use for VCSELs than in their current capacities. Along with the TrueDepth camera, VCSELs are also used by some firms to produce world-sensing arrays used for self-driving vehicles, like Apple's fleet of autonomous vehicles. Apple has invested heavily in the production of VCSEL, with supplier Finisar benefiting from a $390 million infusion as part of Apple's Advanced Manufacturing Fund last year. The cash injection is intended to help the supplier increase its research and development spending on the components, as well as to improve its production. In March, Finisar showed off its under-construction 700,000-square-foot facility in Sherman, Texas dedicated to VCSEL production. At the time, Finisar Allen Vice President and General Manager Curtis Barratt advised an intention of "making Sherman the VCSEL capital of the world, with the components from the facility to be used for "everything from self-driving cars, to gesture recognition, to facial recognition."